We recently took advantage of the sunny Bank Holiday at the start of May and went for a lovely drive to the Co. Down village of Hillsborough. The pretty village is home to the Queen’s residence in Northern Ireland, Hillsborough Castle. It also has a beautiful forest park with a lake and stunning walks. Hillsborough has many popular eateries and we decided to stop in at one we had previously visited, The Parson’s Nose. 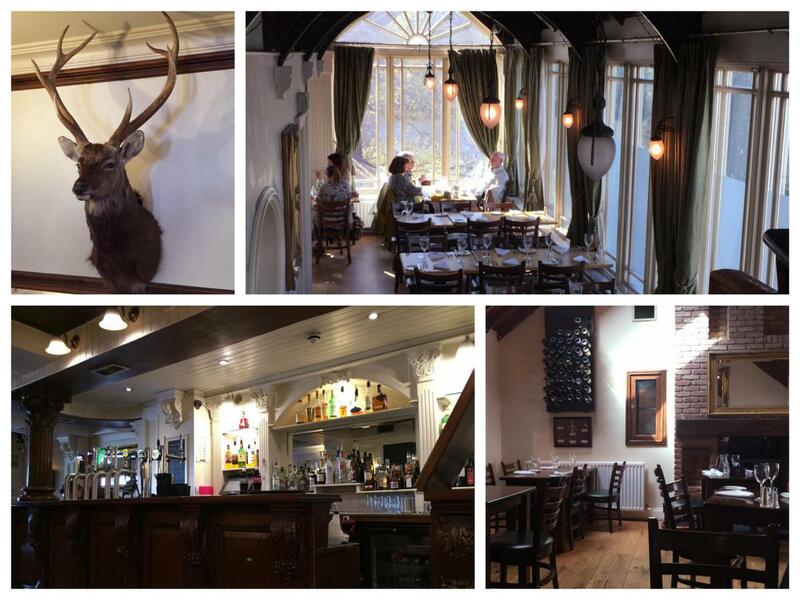 The Parson’s Nose is part of the Balloo Inns Group and has many accolades including Michelin Guide Eating Out in Pubs, McKenna’s Guide, Georgina Campbell’s Ireland Guide and AA Pub & Restaurant Guide. We booked our table online and went along to the bar for what promised to be an enjoyable lunch. 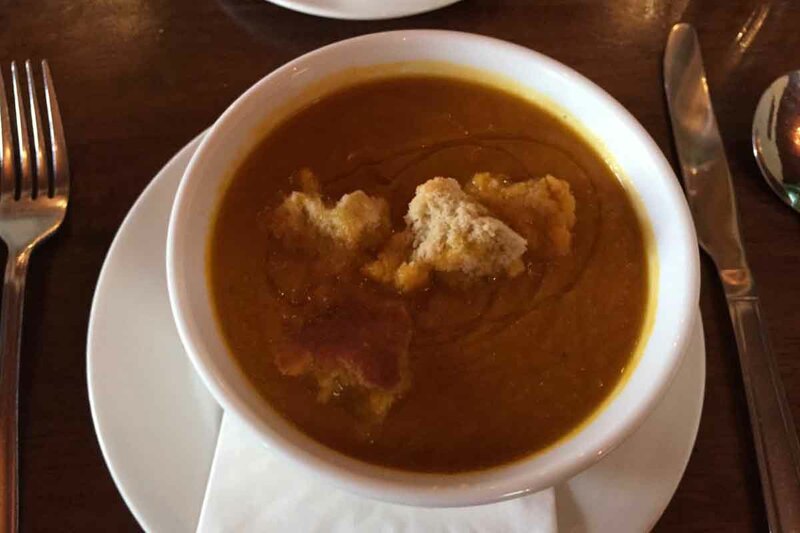 This was the soup of the day and was garnished with buttered croutons and served with fresh bread and Abernethy Butter. The cumin added a bit of spice and heat to the dish while the homemade breads were the perfect accompaniment. If anything, the buttered croutons took a little away from the dish as they turned rather mushy in the soup but overall it was a pleasant way to start the meal. This tart was incredible, and so tasty with the side of wild garlic mayo. The portion was quite large for a starter but it was so delicious that it wasn’t a problem. The cubes of beetroot added the perfect sweetness to the smooth goats cheese flavour. Absolutely loved it! First up for the main course was one of the specials on the day, roast cod with a pork, apple and black pudding fritter, served with potato gratin and spring green vegetables. The cod was cooked to absolute perfection, flaking apart at ease when the fork was put through it. The pork, apple and black pudding fritter was an interesting accompaniment but tasted absolutely fantastic and perfectly complemented the fish and green vegetables. While we wouldn’t be big fans of black pudding, it worked really well in this fritter and it could have easily been served on it’s own. The sticky jus hit the spot as well and the potato gratin was creamy, flavoursome and a great fit. 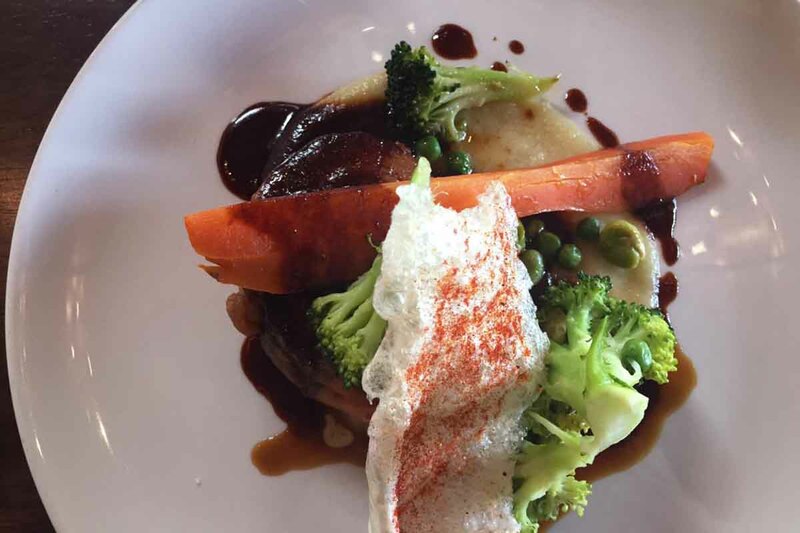 This was a wonderful main dish that really highlighted the skills of kitchen team at The Parson’s Nose – the flavours just dance together in perfect harmony on the plate. 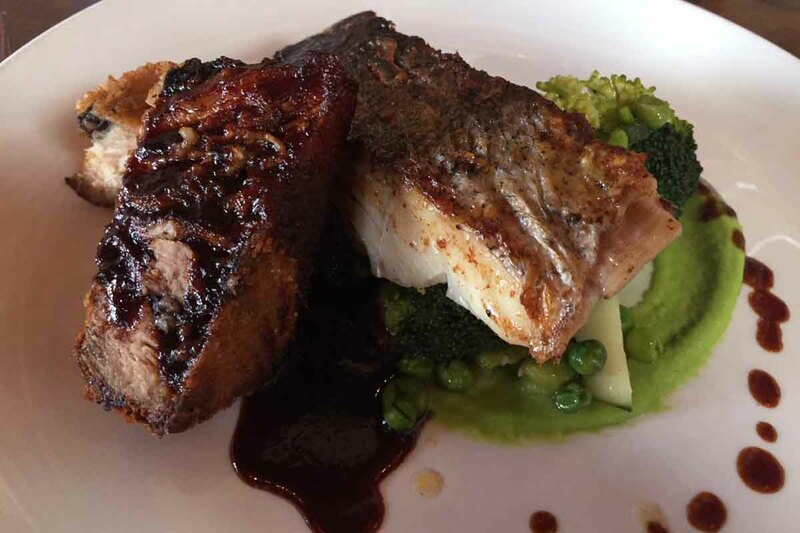 This crispy pork belly was served with an apple and mustard sauce, crackling, roast carrot, broccoli and a lovely potato gratin, and we also opted for a portion of triple cooked chips to share (they hit the spot). The pork itself was perfectly tender although there wasn’t a huge amount of it due to the fattier nature of pork belly. This suited Helen down to the ground though as she doesn’t eat huge amounts of meat and was therefore able to finish the pork belly. The sauce that was served with the dish was rich and flavoursome, and cut through the pork taste to perfectly complement the dish, especially when placed on the fork with a little bit of everything – the veg and gratin. The crackling that accompanied the dish was more of a modern take on pork crackling as it was deep-fried but still had that great flavour and texture that makes pork crackling such a hit. This was another impressive main course and a real tasty dish! The additional side dish of triple cooked chips cost £3.50 as do all side dishes for the main course. 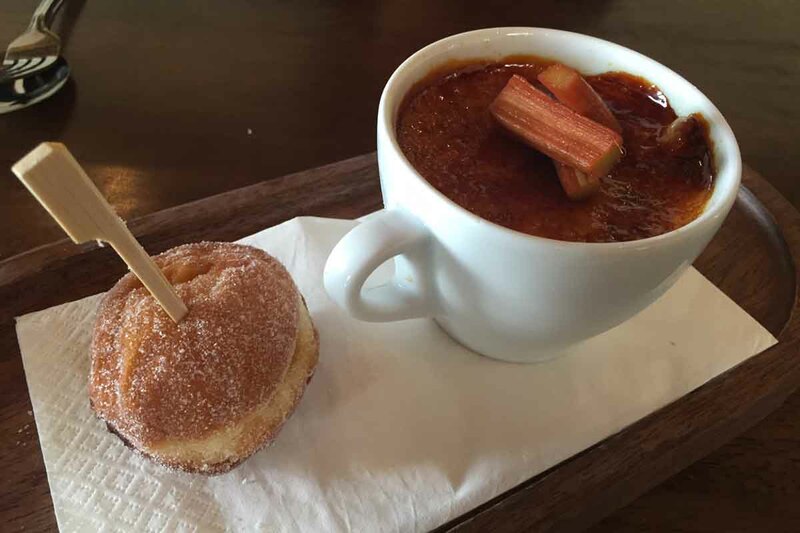 We were pretty full by the time it came to ordering dessert but we took a look at the menu anyway and one dish jumped out straight away – vanilla crème brûlée with poached rhubarb and sugared doughnut. The crème brûlée was topped with poached rhubarb while there was a little rhubarb compote surprise at the bottom of the cup. The deep vanilla flavour of the brûlée was contrasted beautifully with the sharp rhubarb compote with the sugared doughnut a tasty additional treat to finish the meal. We really enjoyed our trip to Hillsborough and The Parson’s Nose and can’t wait to go back again. 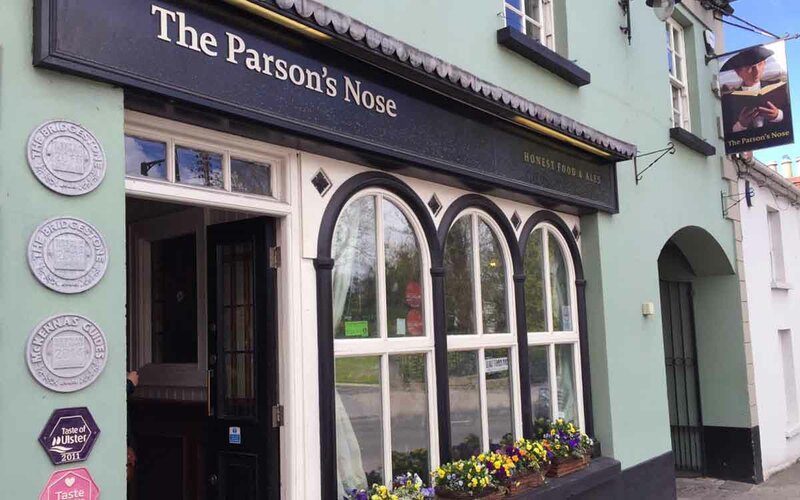 For more information on The Parson’s Nose, and to see the range of menus available, visit www.ballooinns.com/the-parsons-nose. The food and restaurant scene in Northern Ireland is thrieving at the minute and it’s always good to head out and try to experience something new. Belfast is NI’s culinary capital and with good reason, but there are some truly magical dining experiences to be got in many of the small towns and villages across Northern Ireland. 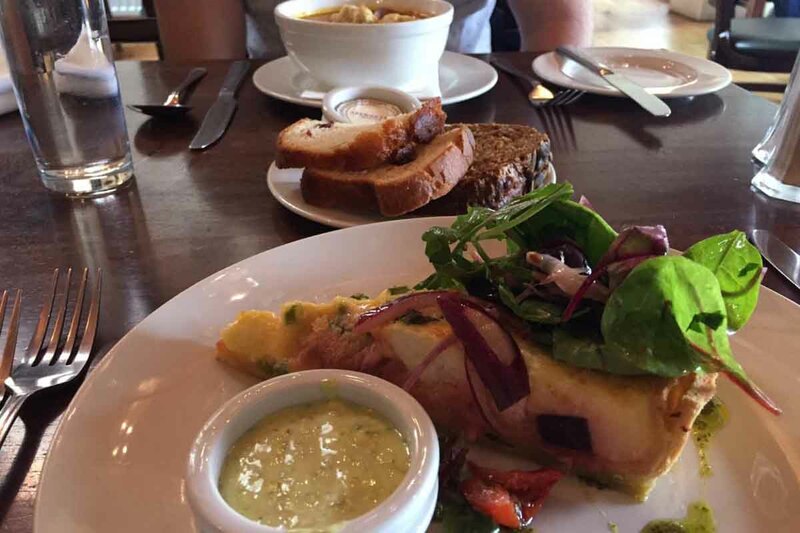 We’re always on the lookout for new dining experiences across NI. If you’ve somewhere you’d like to recommend to us, please mention it in the comments below or shout out to us on Facebook and Twitter.